Signs of High Cholesterol: What are They? What Are Cholesterol Ranges? To understand the signs of high cholesterol, it would be good to understand what cholesterol is and what it does. 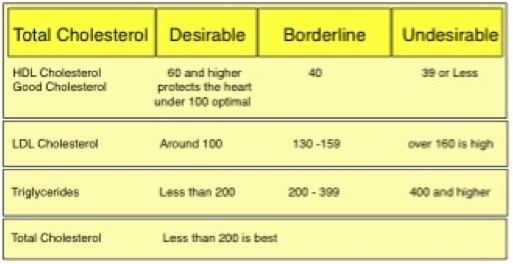 Then below you will find a chart of cholesterol ranges. Chemically, cholesterol is C 27H45 OH. It is a sterol ( a naturally occurring unsaturated steroid alcohol with a waxy solid consistency. Or you could say that it is a compound found in almost every part of the body. It is in your blood, nerves, brain, skin, liver, intestines, and heart to mention a few places where it plays a vital function. Cholesterol is an important part of cell membranes and makes the building blocks of other steroid compounds in the body. Note: Steroids include many hormones. High cholesterol levels in the blood are suspected of being the cause of atherosclerosis. Only a small amount of cholesterol is needed to be a part of the production of natural hormones in the body. It also is involved with creating vitamin D and bile acids that play a part in digesting fat. One of the signs of high cholesterol is not visible. This is because the excess cholesterol in the blood stream may be deposited in the arteries. If it ends up in the arteries of the heart, resulting in narrowing and blockages, it will produce signs and symptoms of heart disease. Signs and symptoms of heart disease, if caused by cholesterol, are very late signs of high cholesterol. If the blockage is complete, a heart attack or fatal rhythm be experienced. Note: Did you know....Coronary Heart Disease claims more lives in the USA than the next 7 leading causes of death combined. A blood test can identify cholesterol levels. The most common is a complete lipid profile, which measures However, this test is not enough. A complete lipid profile measures your LDL (low-density lipoprotein [the bad cholesterol]), total cholesterol, HDL (high-density lipoprotein [the good cholesterol]), and your triglycerides (another fatty substance in the blood). It is recommended that this should be checked every 5 years. Below is a chart of the previously recommended ranges. This is still current but new information may be even more relevant to your needs. Keep reading. The most common first symptoms and signs of high cholesterol is no noticeable symptoms. The first indication will usually be found by a blood test if not seen as signs and symptoms of coronary heart disease. This chart leaves a question to be answered. How can world class athletes die of heart disease even though they have low cholesterol levels. How is it that people with high cholesterol thrive. The latest information may just change the way you think about this. The latest evidence based medicine has shaken things up a bit. Now studies show that women need to have higher cholesterol levels than men do. Without the higher levels, they face a greater risk of heart attack. The good news, there is a glutathione protection connection that is safer than statins. And it is even cheaper. It is more than just your cholesterol levels that matter. Your entire blood profile needs to be balanced. Boosting glutathione does just that.